And another WIP ... my summer quilt for the Four Seasons Quilt Swap. I'm showing it here in its early stages ... still lots of piecing to do, but I am pretty excited about how it's turning out so far. Think it's summery enough? I'm using a cool pattern (Bay Breeze) from Quilts & More, Summer '08. I just realized that this is my 50th post! I am definitely going to do a giveaway, but I'll post it under separate cover. No, this isn't a shameless ploy to get you to come back ... it's just that it's Sunday night and I am physically exhausted. I figured this can wait another day or two! Any good ideas for what to give away? I have some thoughts already, but I am open to suggestions. I also realize that I've slacked off on posting new pictures of Clancy. I promise to get some pictures of the big guy up soon. As a teaser, he's literally doubled in size since we got him 3 weeks ago, and he's fitting in with the family splendidly. Here's a sneak peek at what I'm putting together for the Doll Quilt Swap 4. The top's all done and I'm showing it sitting against the backing. I just have to whip up a label for it and put it all together, and then it will be on its way! Quilt-a-Long - 2 more blocks done! Go show Randi some love on the grand opening of her Etsy shop, Fresh Squeezed Fabrics! And enter to win some free fabric in honor of the grand opening at Randi's blog. I received a tip on a great giveaway on Jackie's blog. 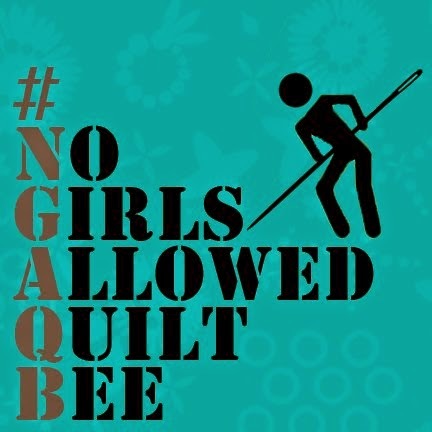 She is a longarm quilter that will actually quilt the winner's work! This would be great for my quilt-a-long quilt ... or one of the other 6 or so completed tops that I have now. Visit Jackie's blog for your chance to win! I think I've mentioned that I joined a Flickr swap group for monthly swaps of 6" - 12" mini quilts. I thought it would be a fun thing to do to practice some skills (namely, binding) and it's pretty easy to get that satisfaction of completing something. The binding's kind of a mess on back, but I was getting noticeably better even by the end of this little quilt. This is the first "real" binding I've ever hand sewn! And for those of you that read my blog (all 4 of you! ), you might notice that it's an adaptation of a table runner I made back in May. This swap's a lot of fun -- you should come check it out. I think I'm going to sit July out, though, and try to catch up on a few things. Turns out it was a great week to be in Boston! 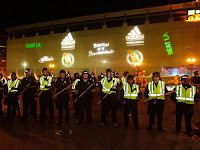 The Celtics beat the Lakers on Tuesday night and, although we didn't have tickets to the game, we watched it down near Quincy Market and enjoyed the post-game festivities outside of the Boston Garden. It was loud and crazy and lots of fun ... and, fortunately, it never turned ugly or violent. You've got to love sports celebrations! Is anyone else doing the Designer Mystery Block of the Month from the Fat Quarter Shop? I signed up for it along with my wife and my mom -- I thought it would be a fun thing for the three of us to do together. We got our first package this week. The fabric is the new Peace on Earth holiday line and it looks reeeeally nice. These should be some nice looking blocks ... and I think I can handle one block per month! Trying to catch up on a few things from the past few weeks. First, the wonderful Tine from Denmark (aka Sodeste) gave me an Arte y Pico award. I have to be honest -- I can't read Spanish so I have no idea what the site says, and I certainly hope that I am not promoting something that I shouldn't be promoting! But I am sure Tine wouldn't mislead me ... so thanks, Tine! A mystery lady known only as "Blondie"
I feel kind of like I'm sending along a chain letter (which I never do), so please feel free to ignore me if you think it's rude! Choose 5 blogs that you consider deserving of this award based on creativity, design, interesting material, and overall contribution to the blogger community, regardless of the language. Post the name of the author and a link to his or her blog by so everyone can view it. Each award-winner has to show the award and put the name and link to the blog that has given her or him the award. The award-winner and the presenter should post the link of the blog , so everyone will know the origin of this award. My favorite thing for lunch, hands down, is a homemade peanut butter & jelly sandwich. Still just as good with a glass of cold milk as it was when I was a kid. I am REALLY good at standardized tests. I don't think it's too much of a measure of how smart a person really is, but just whether or not the person's a good test taker. I guess I am: I got near-perfect scores on both my SAT and GMAT. I HATE eating in the car. I don't know why ... it's just one of those things. I only eat in the car when absolutely necessary, and some people hate road-tripping with me because we have to stop for all meals. Wow, this is tough. OK, I am right handed but also wear my watch on my right hand ... which is typically where lefties wear their watch. That's quirky, right? I was born and raised in Brooklyn, NY, but North Carolina is certainly becoming part of me. How do I know? I LOVE good old fashioned southern sweet tea. And if you've never had it, it is just amazing. I am addicted. (Oh, and lately I've also been pretty addicted to Cherry Limeades from Sonic ... one just opened near our house). OK, six more people to tag?? This chain letter similarity thing is bothering me too much, so I am just going to put it out there to anyone reading and say: have at it if you are so inclined! I finished up my ALQS quilt this weekend, and I must say that I am pretty thrilled with how it turned out. I have pictures of the back and the label, but I'm not going to post them until I know that the recipient has gotten the package. I'm pretty proud of the label, considering it was my first ever and I didn't really know what I was doing. You can't tell too much from these pictures, but the binding's kind of a mess. I am still really new to hand sewing and don't quite have it down yet, but I am happy to report that I seem to be getting better at it as I go. I powered through 4 (relatively difficult) blocks from AmandaJean's quilt-a-long since Monday. Pictured below are blocks 5, 6, and 7 from quilt-a-long II, and another block from the first quilt-a-long. This was really the first time in doing all of these blocks that I got frustrated. Week 5's block was especially tough, and is the first block of all the ones I've made so far to finish noticably smaller than the rest. I hope it's not too tough to work it in to the quilt top, but I guess I'll cross that bridge when I get to it. OK, so I cheated a little bit on that one. It's not technically done yet. The 9 squares are pieced, I just have to assemble the block. By the way, I am really unhappy with how my pictures are turning out. I thought I had a pretty good digital camera, and I've tried to take most of these pictures in direct sunlight. Is there some sort of light setting or adjustment that I can try to make my pictures look more crisp and more accurately show the colors?? I joined a fun little group over on Flickr. Each month, we swap a small, 6" - 12" quilt with a partner. I've never made anything this small before, and I'm having a lot of fun trying to think of new ideas. This weekend, I finished quilting my piece for June and attached the binding. I just have to sew the binding on the back and it's ready to go. I am REALLY happy with my first attempt and I can't wait to post pictures, but I think the etiquette on this type of thing is to wait until the recipient has received the quilt before posting pics ... especially because this isn't a secret swap. Yes, Clancy has finally made it home. He was supposed to arrive on Friday, but due to the heat wave we're having here in the Carolinas, he arrived late Wednesday night to avoid traveling in those conditions. Things are going REEEEALLLY well so far. He is just the sweetest, calmest, smartest, and most well-behaved puppy I've met. We couldn't have asked for more. I was in such a rush to write my last post, I totally forgot two other things I've been working on. First, my wife's college roommate just had a new baby boy, so I'm trying to put together something quick and easy to send up there. Some Debbie Mumm bunny fabric from JoAnn's and a nice flannel backing. They live in New Jersey, so the warm flannel should come in handy once the fall arrives. I'm about halfway done with the top, and the backing is already pieced together. I'm also about finished with the second of the two table runners I had made for Mother's Day. I keep promising my mom that something will be on its way shortly, but I seem to be making progress at glacial speed. No progress on AmandaJean's quilt-a-long, unfortunately. After several weeks of making several blocks per week, I've fallen behind. Need to work on weeks 5 and 6 -- hope to get to them before the end of the weekend. Top, batting and backing are all ready for my ALQS quilt. Just need to take an evening to baste and quilt it. Hope to have that done by the weekend, too. 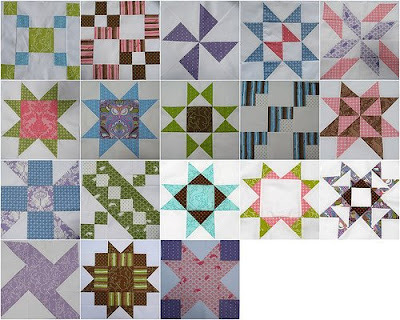 I made a little quilt for the 6"-12" Mini Quilt Swap over on Flickr. This was my first time making something so small. I think it looks good, but the other ones on the site are so amazing ... so I'm just wondering now if mine is up to par. Batting and backing are all ready for this one, too. I hope to have a picture soon. I actually picked back up on the solid color quilt I blogged about a while back. I had put it away for awhile, but wanted to make some progress on it ... especially because the birthday boy who it's intended for already celebrated his birthday. Unfortunately, it seems I made some major miscalculations when cutting this one (several months ago), because I'm short several pieces. 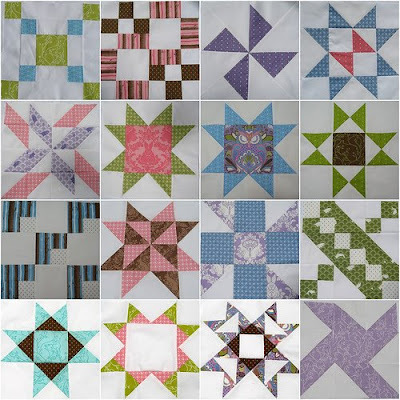 Looks like this lap quilt might be downgraded to a baby quilt because I'm missing so many blocks. Frustrating. 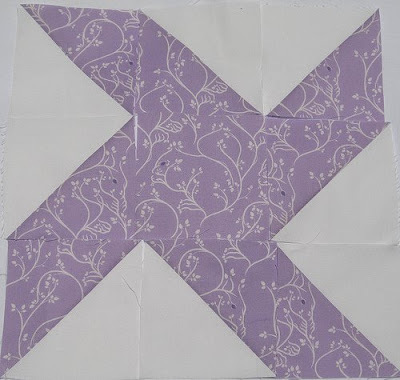 Oh, and I think it will be a while before I make another quilt from this pattern. It's pretty work intensive ... and tedious. Finally, I'm most excited about the progress I've made on one of the other birthday quilts I mentioned a few weeks back. Here are 4 pinwheels (my first stab at pinwheels) made from a Wee Play charm pack. I omitted anything floral because this is for a boy. 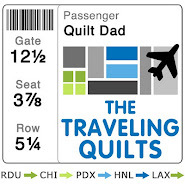 The final quilt will be 4 across by 5 down, with 2 borders added. I love how this is coming out and I think I'm going to hate giving it away ... although I love the recipient to death and I am sure his mom will truly appreciate the gift, which makes it all worthwhile. I hope to wrap this one up after my two swap quilts are done. P.S. Clancy's scheduled to arrive this Friday! We're getting reeeeealllly nervous.